Last night's box office figures put Universal's blockbuster Jurassic World at $1.522 billion, making it the third highest grossing film of all time at the global box office. According to Deadline, the dinosaur adventure surpassed Marvel's The Avengers, which earned $1.52 billion during its 2012 theatrical run. Jurassic World has a lot of work to do if it plans on catching the top two films, James Cameron's Titanic ($2.16 billion worldwide) and Avatar ($2.78 billion). On the domestic side, Jurassic World is still in fourth place with $614.3 million, just behind Marvel's The Avengers's domestic take of $623.3 million. Titanic and Avatar also hold the top two spots at the domestic box office as well, with $658.6 million and $760.5 million, respectively. 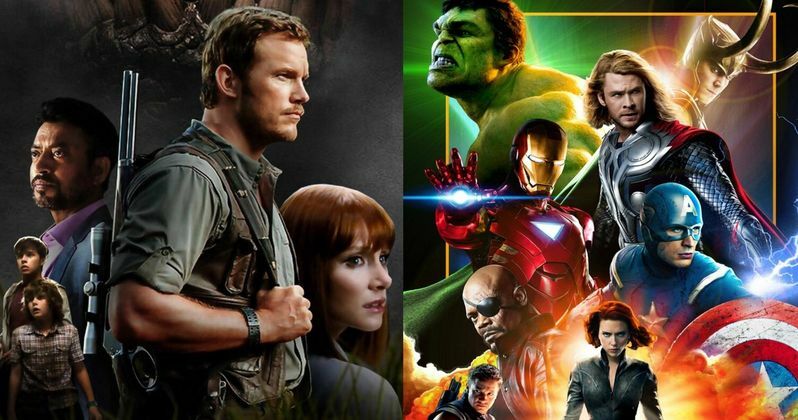 Jurassic World should be able to surpass Marvel's The Avengers for the third-highest domestic gross, but whether or not it will have the longevity to challenge Titanic or Avatar remains to be seen. Jurassic World has set several box office records after its debut on June 12. It broke the record for highest opening weekend, with $208.8 million, surpassing Marvel's The Avengers' three-year record of $207.4 million. It also set records for highest opening week ($296.2 million), highest per-screen average for a wide release ($48,855) and biggest second weekend ($106.5 million). It was also the fastest film to break the $100 million, $200 million, $300 million, $400 million and $500 million box office milestones. Jurassic World is set twenty-two years after the events of Jurassic Park, bringing fans back to Isla Nublar. The island now features a fully functioning dinosaur theme park, Jurassic World, as originally envisioned by John Hammond. After 10 years of operation and visitor rates declining, in order to fulfill a corporate mandate, a new attraction is created to re-spark visitor's interest, which backfires horribly. Star Chris Pratt revealed just after the movie opened that he is already signed on for more sequels, but Universal hasn't announced any plans for the sequel at this time. It isn't known if his co-stars such as Bryce Dallas Howard, Vincent D'Onofrio, Ty Simpkins and Nick Robinson have similar deals in place, but we'll keep you posted as soon as there is an official update on the sequel. Are you looking forward to Jurassic WorldJurassic World sequel?